aur bhole shankar aapke jivan me khushi hi khushi bhar de. Aao Mil Kar Chadhaye Hum Shraddha Ke Phool. Today is the auspicious day of Lord Shiva. help people understand the values of Lord Shiva. to everyone facing difficulties in there lives. 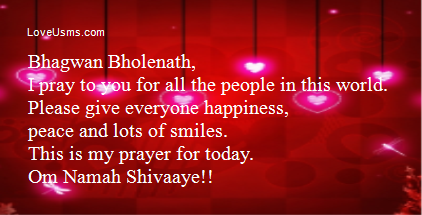 Maha Shivratri ki bahut bahut shubhkamnayein. peaceful life with noble wisdom. May there be peace in every home!!! We wish you all a very Happy Shivratri. May Lord Shiva and Mata Parvati shower their blessings to everyone. May this festival be a purposeful one to everybody. I pray to you for all the people in this world. peace and lots of smiles. This is my prayer for today. 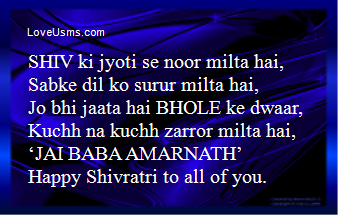 Shivratri blessings to you and your family. 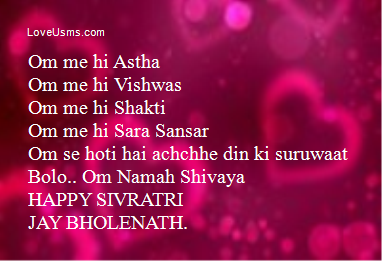 Happy Shivratri to all of you.